irunurun Hits the Ground Running! 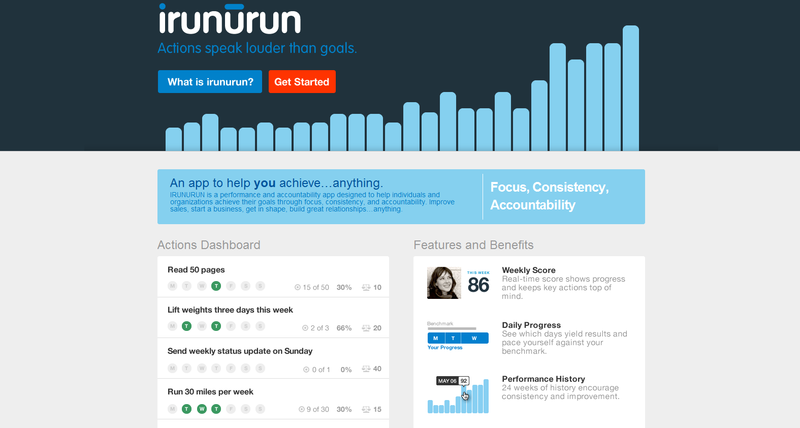 It's been a busy and exciting week at LyntonWeb, and one of the websites we're proud to be launching is irunurun, a brand new and incredibly useful productivity application that helps users achieve their goals by focusing on the actions that matter most. Officially launching tomorrow, irunurun enables individuals, companies, and organizations to achieve goals for themselves and their employees. irunurun is radically different in that it introduces an interactive level of accountability for action management. Rather than focusing entirely on goals, users break their goals down into a short list of recurring weekly actions that align their efforts with their goals. They weigh each action out of 100 total points and earn points toward a weekly score as they get each action done. Each Monday they start with zero points, and throughout the week they work toward 100. Users can see their own weekly score as well as that of their colleagues in real time 24/7, creating a heightened level of accountability. For instance, let's say your personal goals are to lose weight, spend more time with your children, and boost revenues in your company. For each goal, define weekly actions that align with these goals. An action can be something as simple as 'read a bedtime story to my children,' 'eat fewer than 2000 calories each day,' or 'contact 25 decision makers each week.' Define how often you should perform the task - # of times per day or per week - and set a priority (or weight). As you complete each action, you earn the points for that action and your weekly score moves up. irunurun offers two versions of their app. A free do-it-yourself version (called Self-Directed) is available for individuals and professionsal who define their own actions and manage their own accounts. A Premium Directed version allows companies, coaches, and subject matter experts to private label the app and direct the actions and experience of their employees or clients. If you run a sales team and you'd like to have a specific sales goal met, you can develop key weekly actions for your team, such as making five calls or engaging one new potential customer. It's an easy and efficient way to make sure your team members understand which actions should be completed each week and to create accountability for getting them done. Sign up for irunurun's Self-Directed, SD Premium, or Directed version. LyntonWeb helped develop the irunurun.com marketing site. We're thrilled about the potential of their application as word spreads through blogging and social media. Check out irunurun.com to learn more about how the application works and to watch their intro video. Sign up for a free irunurun account, and tell us how you like it!